Yesterday, 26th March 2014, MEP Zofija Mazej Kukovič took part in the 5th Intergenerational Festival in Velenje. Her intention was to share with everyone present there both her and Europe?s view on the situation of younger and older Europeans and on intergenerational bonds, which should be the foundations of all societies. ?European policies are based on lifelong learning and connecting the younger and older generations. A large part of those living in Europe are currently over 65 years old and they still retain their health, plus they have a lot of energy, experience and knowledge. We must enable them to transfer that knowledge to our youth.? The discussion then turned towards the problem of youth unemployment, with several young people present in the audience: ?Today unemployment is a disease that has spread to every household and has filled every nook and cranny.? However, MEP Mazej Kukovič also pointed out that ?young people have never had as many opportunities as they have today. When I was young, life was generally modest. Today there are so many support programmes available that enable them to study wherever they want. Everyone should have the experience of either studying or doing an internship abroad, as it will allow him to better appreciate what we have at home.? 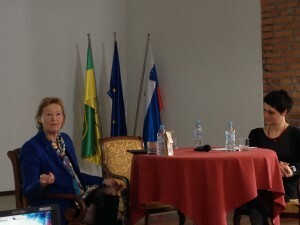 She also emphasised the need for Slovenian educational system to focus more on creativity: ?In America everyone is thinking of where they are going to work. They encourage creativity. Here, they only encourage passivity and making us obedient and quiet. We must adopt a different identity and we must have the courage to have our own creative visions.? It is for this reason that MEP Zofija Mazej Kukovič?s activities are focused exclusively on finding solutions for tomorrow. This includes her project Food for Health and Jobs. ?We have clean water, clean air and healthy soil, but nobody notices this anymore. With everything that we have, with the help of the experience of older generations and with a little bit of creativity, we can easily find solutions. Young people must be courageous in seeking solutions also in the land and transform ideas into self-employment and entrepreneurship.